Back when I lived in Taiwan at the insistence of some of my friends I went prawn fishing once. It was a curious sport and consisted of sitting on an upended plastic bucket next to an artificial pool stocked with hundreds of prawns. You were equipped with a fishing rod, raw chicken meat, and a razor blade. Basically, you cut the chicken with the razor, hook it on the fish hook, dip it into the pool, and just wait. Much like crabbing, there's no tug, you just wait and pull up at irregular intervals and see if you caught anything. I remember catching a good amount because every time I caught one, I'd start screaming. These prawn did not resemble the nice headless, frozen shrimp we can buy in grocery stores. No, these prawns were the size of my hand with long antennae and legs that still moved! It was more akin to an insect than a shrimp, and they scared the heck out of me. Fortunately, my friends had no such issues and were able to net them for me. Apparently, part of the fee that you pay to fish for the prawn included grilling them and serving them for you when you were done. Then I ran into an even larger problem--I had never removed the head from a prawn before; whenever I had that particular issue I just had my mom do it for me. But my mom was half a world away, and the longer I hesitated, the less prawns were left as everybody else was grabbing them as fast as they could eat them. So I finally sucked it up and did it. I'm still really grossed out at pictures of prawn though. Anyways, this recipe has nothing to do with those prawns other than the fact that it is a shrimp recipe, but I just thought I'd share. I believe it is Cantonese in origin, and the first time I learned how to make it was from a friend in college that had learned it from his mom. The combination of juicy prawns lightly fried and tossed in a sweet and tangy mayonnaise based sauce is hard to resist. Add to that candied walnuts and a ring of bright green broccoli, and you've got yourself a dish that will definitely impress. The trickiest part is timing--you want to fry the shrimp at the last second so that it is still hot when you serve it. Otherwise, you can prepare everything else ahead of time. 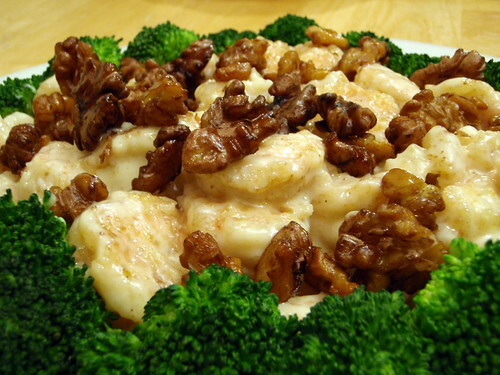 I loosely followed the Honey Walnut Prawns recipe from About.com, but the next time I make this I will definitely try another method for making the candied walnuts. Their directions were pretty complicated, and I know I've made candied walnuts before via another method that involved toasting them rather than frying them. There are tons of recipes out there for making candied walnuts so I'll let you choose whichever one seems best for you. Rinse walnuts, then boil in 5 cups water for 15 minutes. Start boiling another 2 cups of water separately. Drain and add 2 cups boiling water and sugar. Continue boiling and stirring occasionally until sugar dissolves. In a small saucepan, heat oil until almost smoking, about 400 °F. With two slotted spoons, use the first to drain a small batch of walnuts. Carefully add to the oil and stir with the second slotted spoon. Deep fry walnuts until shiny and brown, no longer golden; this will only take a minute or two. Use the second slotted spoon to remove the walnuts from the oil and place in a heat-proof bowl lined with paper towels to drain. 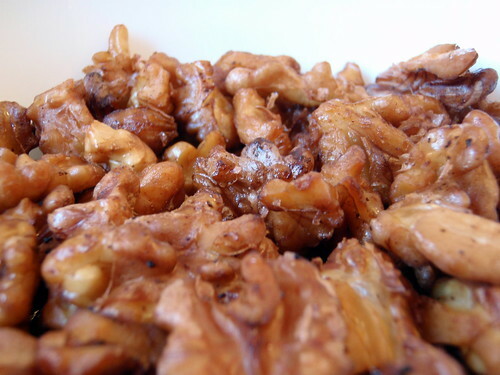 Continue frying walnuts in small batches. Store walnuts in an air-tight container until ready to use. In a large saute pan heat 1 tablespoon of oil until hot. Add broccoli and salt and stir fry for 2-3 minutes, until the broccoli turns bright green. Add 1/2 cup water to the pan and cover, allowing the broccoli to steam for about 3-5 minutes until done. 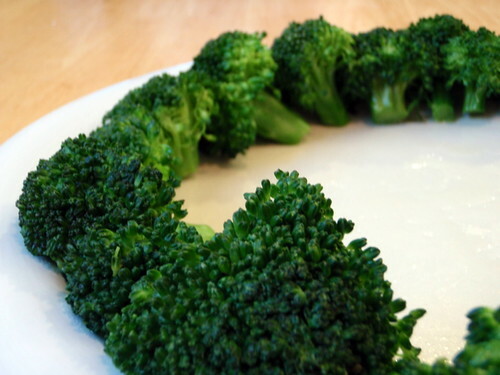 Remove from pan and line the edge of a large plate with the broccoli pieces. Alternatively, you can steam the broccoli instead of pan-frying/steaming them. Mix mayonnaise, sweetened condensed milk, and lemon juice in a medium bowl until smooth. Place the corn starch in a shallow bowl and coat the shrimp well. Heat 1/2 cup of oil until very hot, then deep fry the shrimp until golden brown, working in small batches. This is a very quick process; the shrimp only needs to be cooked for about 30 seconds each. Drain, then fold in mayonnaise mixture. 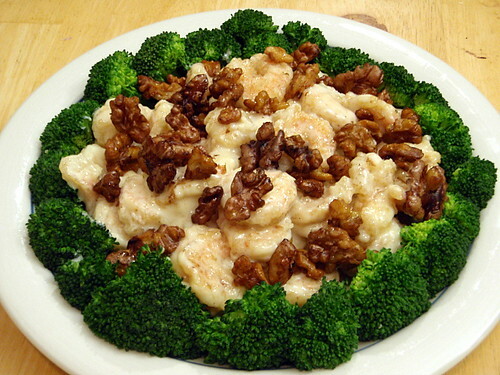 Mix well, sprinkle with walnuts, and transfer to the middle of the dish ringed with broccoli. Serve hot with rice. I made it tonight, and it tasted just like the one from my favorite restaurant.Thank you so much for taking your time to post such a beautiul and detailed recipe. What kind of mayo did you use? I think I used Hellman's. I am married with 3 kids, but I have to say, I love you! hahah! thank you for sharing! My 11 year old and I truly LOOOOVE this dish! jay - These are my favorite types of comments. ^_^ Glad it worked out for you! I was sitting here eating my leftover walnut and mayo shrimp from dinner last night wishing I could find a recipe so I could enjoy it more often. I started googling and here you were I haven't tried it yet of course but it looks and I am sure tastes like what I am eating. I can't wait to prepare it. I did this for an "audience test" for the upcoming Chinese new year dinner. Turned out that my friends liked it so much! One of them liked the mayo very much; mayo + condensed milk + lemon juice are such an awesome, delish combination. This was seriously tasty! My walnuts weren't as sweet as I would have liked and I fried the shrimp in more than 1/2 cup oil, but otherwise I cooked it just as the recipe is written. I doubled this recipe and it was still the first thing finished at my family's New Year dinner! Awesome recipe!! Thank you soooo much! I used to order this every time I went out to eat at a Chinese restaurant. Now I never order it anymore. I've made this a few times for some friends and family and they all loved it. My dish didn't taste exactly like the restaurant's version, but I am still working on it. Only thing is that I can't get the corn starch to stick onto the shrimp too well. Any suggestions?? I've just recently started my own cooking blog. Come check it out! The shrimp I use is usually already wet enough for the corn starch to stick. If your shrimp is too dry maybe run it under some water first? You don't want the shrimp to be dripping wet, but just moist enough for the corn starch to stick. I ate this dish in Chinatown in Philadelphia, Pa...could not find any restaurant who makes this in my hometown of Lancaster, Pa..I fell in love with it!!! Thank you so much for posting this recipe. I'm about to make my Jasmine rice, and start the sauce, as well as the shrimp. I made the walnuts last evening. Thank you again!!!!!! BOOYAH! GREAT DISH! THANK YOU!